To Cite: Mehrandish R, Dehghan-Nayeri N, Rahimian A, Toutounchi A, Mellati A. Inhibitory Effects of Cichorium Intybus Root Extract on the Proliferation and Lipogenesis of the SKBR3 Cells, Int J Cancer Manag. 2018 ; 11(4):e9436. doi: 10.5812/ijcm.9436. Background: Fatty acid synthase (FASN) is a key enzyme in de novo lipogenesis pathway. FASN overexpression is a common feature of many human cancers like breast cancer. Furthermore, FASN expression in HER2 - positive cell lines like SKBR3 is more than other cell lines, such as MCF - 7, which are not HER2 - positive. Cichorium intybus is a medicinal herb and methanolic extract of this plant significantly suppressed cell viability and growth in some cancer cells. Objectives: In this study, we aimed at investigating the effect of methanolic extract of Cichorium intybus on the FASN expression and, therefore, lipogenesis pathway in human breast cancer SKBR3 cell line. Methods: We assessed the cytotoxicity effect of Chicorium intybus on the cell viability of SKBR3 cells, using MTT assay. In addition, apoptosis rate was assessed by annexinV/PI flow cytometry. Finally, Real time q - PCR was used for the analysis of FASN gene expression. Results: The results showed that the methanolic extract of Cichorium intybus caused a dose - dependent decrease in the cell viability of SKBR3 cells. Additionally, the treatment of confluent SKBR3 cells with extract led to reduced FASN expression at mRNA level. Conclusions: These results suggest that Chicorium intybus not only inhibits cell viability in a dose - dependent manner, but also presumably inhibits lipogenesis by markedly decreased FASN expression as a key lipogenic enzyme. It has been demonstrated that flavonoids decrease breast cancer cell growth, through the inhibition of fatty acid synthase and, thus, reduces the production of lipids, which are needed to build cell membranes of cells (1). On the other hand, Cichorium intybus is known as a good source of flavonoids and tannins. As a result, since the FASN gene expression is increased in many cancers, therefore, Chicorium intybus extract as a flavonoids source can be considered a new treatment for many of FASN overexpression - related cancers. Cichorium intybus is a small herb from Asteraceae family, which is also known as chicory and it has long been known as a medical plant in Eurasia (2). Fatty acid synthase is the key enzyme in fatty acid synthesis de novo pathway (3) and it is producing palmitate by compounding acetyl - coA, malonyl - coA, and consuming NADPH (4). Thus, this enzyme plays a role in providing necessary lipids for building cell membranes and let cancer cells have faster growth and higher proliferation (5, 6). The overexpression of fatty acid synthase is a common feature of many human cancers and its activity is essential for the survival of cancer cells (7). Additionally, FASN overexpression is a poor prognostic factor in many solid tumors and leukemia (8, 9). FASN gene expression level is different in various cancer cell lines so that among human breast cancer cell lines, SKBR3 has the highest expression of this enzyme. Inasmuch as, FASN is overexpressed in cancerous tissue compared to surrounding normal tissue; therefore, alteration in expression this gene is tumor - specific and the inhibition of this enzyme leads to the decreases of de novo fatty acid synthase pathway in cancer cells with no effect on non - malignant cells (10). Therefore, according to the mentioned roles of fatty acid synthase enzyme in various cancers, the inhibition of this enzyme by herbal or chemical inhibitors can be effective in cancer cell growth or even metastasis. Since previous studies have investigated FASN inhibition by flavonoids in other cell lines like, MDA - MB - 231 (human breast cancer cells) and the inhibition of this enzyme by methanolic extract of Cichorium intybus in Jurkat cells (human T lymphocyte cells) (11, 12), we decided to study the effect of Cichorium intybus extract on fatty acid synthase expression in SKBR3 cell line (human ER - negative/HER2 - positive breast cancer cell) for the first time. In the present study, we decided to investigate the effect of Cichorium intybus extract on fatty acid synthase expression in human breast cancer SKBR3 cell line. Cell culture medium, DMEM (Dulbecco’s Modified Eagle medium), FBS (Fetal Bovine Serum), and PBS (Phosphate Buffered Saline) were purchased from Gibco (Grand Island, NY). MTT (3 - 4, 5 - Dimethylthiazol - 2 - yl) - 2, 5 - Diphenyltetrazolium Bromide) powder was obtained from Sigma (St. Louis, MO, USA). DMSO (Dimethyl Sulfoxide) was purchased from Sigma - Aldrich (St. Louis, MO, USA). The RNA extraction kit was bought from GeneAll Biotechnology CO (Seoul, Republic of Korea). Annexin V - FITC Apoptosis Detection Kit was obtained from eBioscience (San Diego, USA). RevertAid First Strand cDNA Synthesis kit was purchased from Thermo Fisher (Hudson, NH, USA). SYBR Green Master Mix was obtained from Takara (Japan). Chicorium intybus roots were collected from around Kashan, Iran and were identified by the Traditional Medicine Research Center, Shahid Beheshti University of Medical Sciences, Tehran, Iran. The methanolic extract of Chicorium intybus root was done by the maceration method for 24 hours with continuous shaking at room temperature. The filtrate was evaporated to dryness and used for evaluation. Human breast cancer SKBR3 cells were purchased from the Pasteur Institute of Iran, Tehran. Cells were cultured in DMEM medium, containing 10% FBS and 1% penicillin/streptomycin and, then, incubated At 37°C in a humidified incubator with 5% CO2. SKBR3 cells were seeded in 96 - well plates at the density of 5 × 103 cell/well. When the cell confluency reached to 40% top 50% (24 hours after seeding), cells were treated with Cichorium intybus (200, 300, 400, 500, and 600 µg/mL) against control (0.1% DMSO without any treatment) for 24, 48, and 72 hours. After the desired time, MTT assay was accomplished according to ATCC protocol and, finally, determination of cell viability was done, using ELISA reader. Absorbance was measured by ELISA reader at 570 and 630 nm. SKBR3 cells were seeded in 6 - well plates at the density of 2 × 105 cells/well. Twenty - four hours after seeding, cells were treated with the cited concentrations of Cichorium intybus extract for 48 hours. Then, the preparation of cells was performed according to the Annexin V - FITC Apoptosis Detection kit protocol. At the end, cells were analyzed by flow cytometry. For RNA extracting, SKBR3 cells were seeded in 6 - well plates at the density 2 × 105 cells/well. Twenty - four hours after seeding, cells were treated with the cited concentrations of Cichorium intybus extract for 48 hours and, then, RNA extraction was done by GeneAll kit. Next, total RNA was used to produce cDNA by RevertAid First Strand cDNA Synthesis kit. The expression of FASN and GUS gene (as a reference gene) were examined by Real time PCR. The quantity of the RNA samples was analyzed by UV - spectroscopy (NanoDrop TM 2000 Spectrophotometer, Thermo Scientiﬁc, USA) at 260 and 280 nm and the quality of extracted RNA was tested by the 1% agarose gel electrophoresis. For the assessment of quantity and quality of Real time PCR results, a single amplification curve was drawn, using RotorGene device. The assessment of primers sequence was done, using Primer - BLAST and the primers were designed exon spanning to only target mRNA. In addition, the Pfaffl method was used to calculate the relative expression of each gene (13). Real-time PCR primers sequences are shown in Table 1. Data analysis was performed, using SPSS 16.0. One - way ANOVA and Post Hoc tests were applied for the data analysis. P < 0.05 data were considered statistically significant. In our previous study, we investigated the cytotoxicity effect of Cichorium intybus extract on cell viability of SKBR3 cells, using MTT assay (14). As can be seen in Figure 1, the results of this study showed that Cichorium intybus extract decreases the cell viability of SKBR3 cells in a time- and concentration - dependent manner. The IC50 value of Chicory extract on SKBR3 cells was 400 and 300 after 48 and 72 hours treatment, respectively. The investigation of apoptosis induction, using the annexin V/PI flow cytometry, showed the increased apoptosis rate in extract treated cells in a dose-dependent manner. The incubated cells in the presence of different concentrations of the extract for 48 hours showed total apoptosis 4.86%, 7.74%, 18.92%, 21.21%, and 14.61% in concentrations of 200, 300, 400, 500, and 600 µg/mL of extract, respectively (Figure 2). Real time q - PCR technique was done to assess the effect of Chicorium intybus extract on FASN expression in SKBR3 cells. The results showed that Cichorium intybus extract significantly down - regulated the expression of FASN in SKBR3 cells. As shown in Figure 3, the inhibitory effect of Chicorium intybus on FASN expression depends on the concentrations. 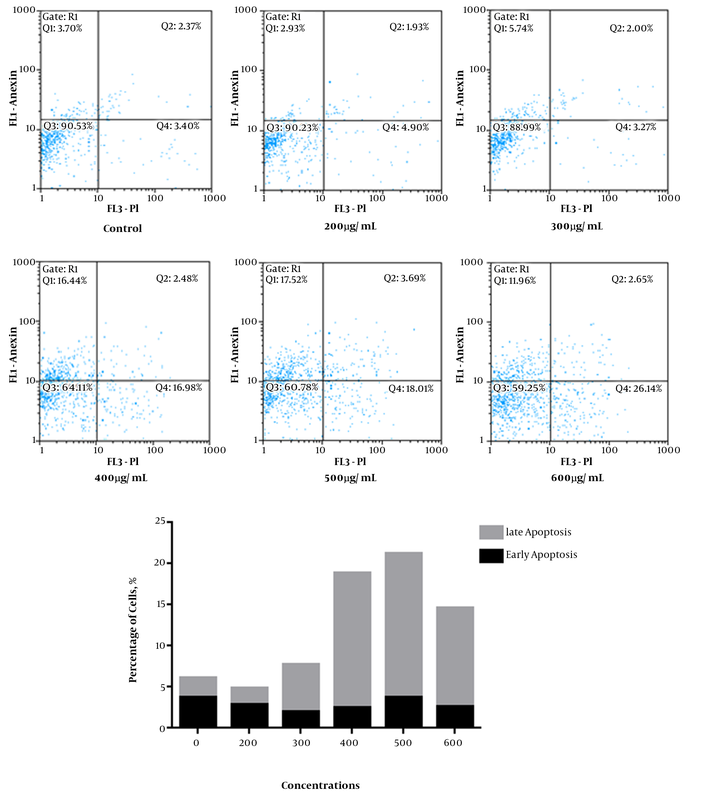 In SKBR3 cells treated with the concentrations of 200, 300, 400, 500, and 600 µg/mL of extract for 48 hours, the expression of FASN decreased by 1.1, 1.5, 6.5, 4, and 3.5 folds, respectively. Breast cancer is the most prevalent cancer and the second cause of death among women around the worlds, forming 22.9% of all cancers (12, 15). Fatty acid synthase is a pivotal enzyme in de novo lipogenesis pathway. This enzyme produces lipids, especially palmitate, which is the first synthesized lipid in cell membrane and other types of lipids derived from it. Additionally, the over expression of FASN is a common feature of many human cancers like breast cancer. Importantly, fatty acid synthase has a significant role in providing needed lipids for building cell membrane and required energy for the high proliferation rate of cancer cells or metastases (16). In recent years, the identification of molecular mechanisms is involved in intracellular signaling pathways and development of cancer, leading to the recognition of molecules or pathways, which are necessary for cancer cell viability. One of the novel therapeutic approaches is targeting these molecules and pathways, which are known as signal transduction therapy (STT) (17). Given the role of fatty acid synthase enzyme in signaling pathways regulating lipogenesis, it is expected that the inhibition of this enzyme by chemical and herbal compounds be effective in preventing the growth of cancer cells. Various chemical compounds for the inhibition of fatty acid synthase are used, but recently botanicals are more interested because of fewer side effects of them. One of the greatest inhibitor of FASN is flavonoids, which are found in methanolic extract of Chicorium intybus in a large amount (1). With regard to the issues raised, this study was designed to assess the effects of methanol extract of Chicorium intybus as a chemoprevention potential alternative agent on fatty acid synthase gene expression in human breast cancer SKBR3 cell line. In a study accomplished by Esmaeilbeig et al., it was reported that IC50 of Cichorium intybus extract on Jurkat cell line was 138µg/mL after 48 hours and they also stated that Chicorium intybus extract could decrease the cell viability in Hela (Cervical Epitheloid Carcinoma) and Fen (Bladder Carcinoma) cell lines after considered treatment (18). 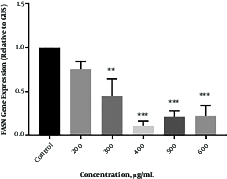 As shown in Figure 1, IC50 values of Chicorium intybus extract on SKBR3 cells were 400 and 300 µg/mL after 48 and 72 hours of treatment, respectively, indicating that the methanol extract of Chicorium intybus impacts on the survival of SKBR3 cells in a dose- and time - dependent pattern. The results of the current study are in agreement with other studies, for instance in a study conducted by Esmaeilbeig et al., IC50 of Cichorium intybus extract on cell viability of K562 cell line (myelogenous leukemia) obtained 400 µg/mL after 48 hours treatment (18). Additionally, in a study carried out by Gospodinova et al., it was reported that Chicorium intybus extract with concentrations between 30 to 600 µg/mL has a significant effect on the viability of MCF - 7 cancer cells in 24 hours and the IC50 of Cichorium intybus was 409 µg/mL (19). As shown in Figure 2, the different concentrations of Cichorium intybus (300, 400, 500, and 600 µg/mL) caused apoptosis in SKBR3 cell line after 48 hours treatment. Thus, 500 µg/mL may be considered the most effective dose for the induction of apoptosis in SKBR3 cells. This result is in line with another study conducted by Saleem et al. They reported that Cichorium intybus extract induced apoptosis in Jurkat cells with the most effective dose 25 µg/mL (12). 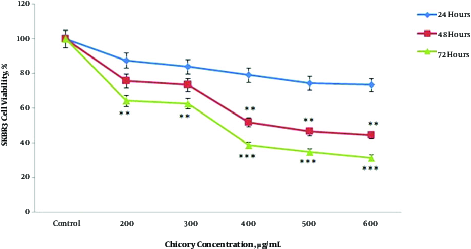 As shown in Figure 3, treatment with the different concentrations of Chicorium intybus extract can reduce the fatty acid synthase gene expression. Gene expression decreased in all concentrations, but there was a significant reduction in gene expression in the concentrations of 300, 400, 500, and 600 µg/mL after 48 hour treatment. Since FASN has a significant role in regulating lipogenesis, the decreased expression of FASN in the increased concentrations of extract may influence on proliferation and metastasis derived from lipogenesis pathway. In summary, the methanolic extract of Cichorium intybus can induce apoptosis in SKBR3 cells and this extract also down - regulates the expression of fatty acid synthase in a dose - dependent manner. Therefore, the inhibitory effect of Chicorium intybus on fatty acid synthase expression may decrease proliferation and migration by affecting lipogenesis in human breast cancer SKBR3 cell line. 1. Tian WX. Inhibition of fatty acid synthase by polyphenols. Curr Med Chem. 2006;13(8):967-77. [PubMed: 16611078]. 2. Street RA, Sidana J, Prinsloo G. Cichorium intybus: Traditional Uses, Phytochemistry, Pharmacology, and Toxicology. Evid Based Complement Alternat Med. 2013;2013:579319. doi: 10.1155/2013/579319. [PubMed: 24379887]. 3. Berndt J, Kovacs P, Ruschke K, Kloting N, Fasshauer M, Schon MR, et al. Fatty acid synthase gene expression in human adipose tissue: association with obesity and type 2 diabetes. Diabetologia. 2007;50(7):1472-80. doi: 10.1007/s00125-007-0689-x. [PubMed: 17492427]. 4. Wakil SJ, Stoops JK, Joshi VC. Fatty acid synthesis and its regulation. Annu Rev Biochem. 1983;52:537-79. doi: 10.1146/annurev.bi.52.070183.002541. [PubMed: 6137188]. 5. Vazquez-Martin A, Colomer R, Brunet J, Menendez JA. Pharmacological blockade of fatty acid synthase (FASN) reverses acquired autoresistance to trastuzumab (Herceptin by transcriptionally inhibiting 'HER2 super-expression' occurring in high-dose trastuzumab-conditioned SKBR3/Tzb100 breast cancer cells. Int J Oncol. 2007;31(4):769-76. [PubMed: 17786307]. 6. Cairns RA, Harris IS, Mak TW. Regulation of cancer cell metabolism. Nat Rev Cancer. 2011;11(2):85-95. doi: 10.1038/nrc2981. [PubMed: 21258394]. 7. Sugino T, Baba K, Hoshi N, Aikawa K, Yamaguchi O, Suzuki T. Overexpression of fatty acid synthase in human urinary bladder cancer and combined expression of the synthase and Ki-67 as a predictor of prognosis of cancer patients. Med Mol Morphol. 2011;44(3):146-50. doi: 10.1007/s00795-010-0517-0. [PubMed: 21922386]. 8. Alo PL, Visca P, Marci A, Mangoni A, Botti C, Di Tondo U. Expression of fatty acid synthase (FAS) as a predictor of recurrence in stage I breast carcinoma patients. Cancer. 1996;77(3):474-82. [PubMed: 8630954]. 9. Dehghan-Nayeri N, Gharehbaghian A, Goudarzi Pour K, Eshghi P. Over expression of the fatty acid synthase is a strong predictor of poor prognosis and contributes to glucocorticoid resistance in b-cell acute lymphoblastic leukemia. World Canc Res J. 2016;3(3). 10. Chuang HY, Chang YF, Hwang JJ. Antitumor effect of orlistat, a fatty acid synthase inhibitor, is via activation of caspase-3 on human colorectal carcinoma-bearing animal. Biomed Pharmacother. 2011;65(4):286-92. doi: 10.1016/j.biopha.2011.02.016. [PubMed: 21723078]. 11. Brusselmans K, Vrolix R, Verhoeven G, Swinnen JV. Induction of cancer cell apoptosis by flavonoids is associated with their ability to inhibit fatty acid synthase activity. J Biol Chem. 2005;280(7):5636-45. doi: 10.1074/jbc.M408177200. [PubMed: 15533929]. 12. Saleem M, Abbas K, Naseer F, Ahmad M, Javed F, Hussain K, et al. Anticancer activity of n-hexane extract of Cichorium intybus on lymphoblastic leukemia cells (Jurkat cells). Afr J Plant Sci. 2014;8(6):315-9. 13. Pfaffl MW. A new mathematical model for relative quantification in real-time RT-PCR. Nucleic Acids Res. 2001;29(9). e45. [PubMed: 11328886]. 14. Mehrandish R, Mellati AA, Rahimipour A, Dehghan Nayeri N. Anti-Cancer activity of methanol extracts of Cichorium intybus on Human Breast Cancer SKBR3 Cell Line (2016). Razavi Int J Med. 15. Menendez JA, Lupu R. Fatty acid synthase and the lipogenic phenotype in cancer pathogenesis. Nat Rev Cancer. 2007;7(10):763-77. doi: 10.1038/nrc2222. [PubMed: 17882277]. 16. Fonseca-Alaniz MH, Takada J, Alonso-Vale MI, Lima FB. Adipose tissue as an endocrine organ: from theory to practice. J Pediatr (Rio J). 2007;83(5 Suppl):S192-203. doi: 10.2223/JPED.1709. [PubMed: 17989837]. 17. Tavasoli M, Ghaedi K, Tavasoli Z, Sadeghi M. Signal transduction for cancer treatment. Genetics in the Third Millennium. 2007;4(4). Persian. 18. Esmaeilbeig M, Kouhpayeh SA, Amirghofran Z. An Investigation of the Growth Inhibitory Capacity of Several Medicinal Plants From Iran on Tumor Cell Lines. Iran J Cancer Prev. 2015;8(5). e4032. doi: 10.17795/ijcp-4032. [PubMed: 26634114]. 19. Gospodinova Z, Krasteva M. Cichorium intybus L. from Bulgaria inhibits viability of human breast cancer cells in vitro. Genet Plant Physiol. 2015;5(1):15-22.